A summertime salad where the cheese is the star! In a large bowl add the arugula, lemon juice and olive oil. Toss together to coat the arugula. Add the strawberries, pine nuts, and a pinch of salt and pepper. Toss to coat. Plate a portion of the salad, burrata, chicken and baguette. 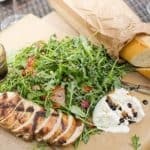 Drizzle the salad and burrata with balsamic reduction. Use the slices of baguette to make little bite size sandwiches or to mop up all the delicious balsamic!